The winner, Mr Anuar (center) with Perseid Telescope representative, CK Lim (left) and Dr. Chong of USM School of Physics. 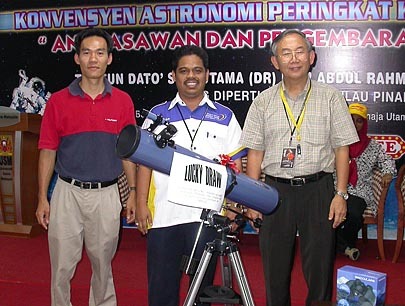 Perseid Telescope would like to congratulate Mr. Anuar for winning the grand prize of the lucky draw held during the USM Astronomy Convention 2007. The prize is a 4.5" Reflector telescope on EQ mount worth RM895, sponsored by Perseid Telescope. Two other lucky winners won a pair of binoculars each.